and Wim van Egmond (seated behind Sonja). EMCO, a London-based performance artist, had the idea to create a festival of performance as part of the annual Bermondsey Carnival in Southwark Park, London, U.K., and invited me to participate. 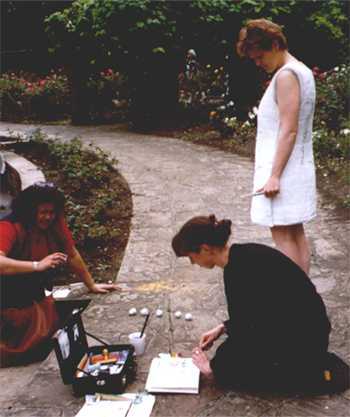 It evolved into a series of performances and installations by 25 European-based artists in and around the park and the Cafe Gallery over a five-day period in May 1999. I decided to invite a number of others to work with me because I was interested in creating a sense of 'community' through performance, rather than an act made by one individual. Two one hour performances on May 31st 1999: Sarah Buist, Geeske Harting, Wim van Egmond, Sonja van Kerkhoff, Jessy Rahman, Joke van Stuijvenberg, & Jacqueline Wassen. >> More info about the artists. As people entered the semi-circular rose garden from one side, Jessy invited them to sit and eat a mango. If they agreed to this, he supplied them with utensils and while chatting he asked them about where they thought the mango came from, leading onto other questions and comments on 'roots' and sources for things. Left to Right: Tama McGlinn-van Kerkhoff (inside the ball), Wim van Egmond (seated in background), and Jessy Rahman seated on the left. He was feeding them an exotic fruit, in a sense an extension of himself as a Surinamese living in Europe, but at the same time inviting them to reflect in a playful way on cultural difference. He then dried the pips and stamped them with a rose stencil and hung these in a line along the fence leading to the other side. If people entered the garden from the other side, Sarah greeted them and asked them to read a poem about taking risks. She then asked them some direct questions to get them talking about this subject and finally asked them to write a word down on a piece of paper. Detail of Sarah Buist's work. They were then invited to hang this word on the fence. In between each word she hung a 'seed' on a string. The seeds were plaster-of-paris covered walnuts. 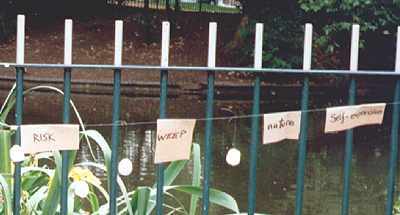 So reminders of interaction (with Jessy and Sarah) gradually extended inwards from each end of the fence by the pond. Wim had taken some water out of this pond and had put it under a microscope as part of his promotion of 'the less than one millimetre world'. His approach was educational. 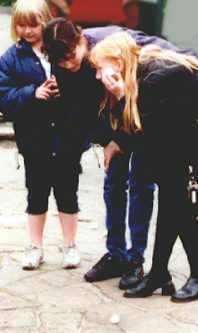 He showed people how to look through a microscope and the living world they became aware of did the rest. Jacqueline set up shop a little further in the circular path from Wim. 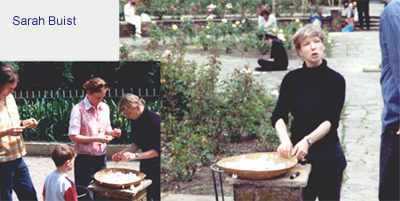 She opened her suitcase and took out her art-making tools and proceeded to paint, draw and write using the rose garden as her subject matter, inspiration and studio. If people came by she talked with them, and in this way her studio was interactive because it was more than just 'plein air'. behind her, Joke van Stuijvenberg. The small white balls are the "Seeds of Hope" by Sonja van Kerkhoff. Geeske also sat on the ground to draw inspiration from the garden, but she did this with a twist. She took a thorny branch from the garden and proceeded to draw it again and again on separate sheets of paper. When each drawing was finished she placed this on the ground around her, and started on another until she had created a circle of drawn (out) thorns around her. Once finished, she walked out of the circle to rest on a bench for the time. This performance had a double twist. The focus on the thorn, the part of the rose that hurts us and serves to protect the plant was a metaphor for the all-alone-in the-world artist who locks him/herself in a studio focusing on one particular in the world and calling that 'universal'. But it also related to her personal daily struggle. Geekse has a severe muscular disorder. She had to withdraw to the bench to recover from the strain of sitting for half an hour. Her gesture of extreme 'non-interaction' in focussing on a thorn and then leaving that on loose sheets for the public to puzzle over, generated discussion around it. People found this circle of thorns disturbing amidst all the colourful roses, and unlike the other works in our performance, there was no living person associated with this piece. 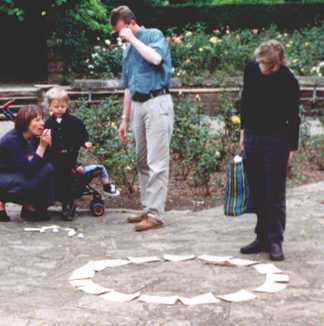 The visitors were forced to make their own interpretations of the circle of pencilled thorns. It was a very well thought-out piece, out of necessity, and it made an impact on people who didn't know who that 'alone-in-her-studio/body' artist was. Its subject matter and location, at the point where the paths meet, and not the in-the-body artist, stimulated interaction with the visitors. Joke van Stuijvenberg and Tama. 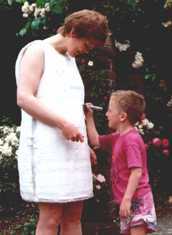 In contrast, Joke's plaster-of-paris dress moulded to the contours of her body, was the site for interaction with the public. People were asked to write a memorable colour in black ink on the dress and so the white of the dress gradually became blackened with words of colour. For most visitors her work was the most visually stimulating. She was a walking work of art. I often use my children in my art but here Tama had his own ideas about what he wanted to do. All I did was place a large transparent ball between some rose bushes and help him to get into it. He did the rest. 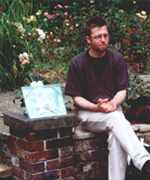 He had a piece of polystyrene found on the streets of London and proceeded to carve it into a sculpture for the garden pedestal. 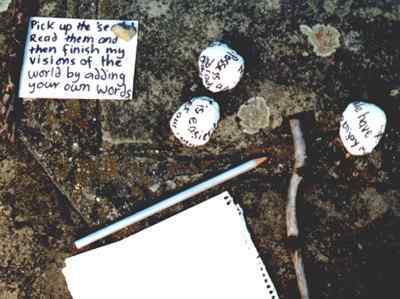 When people ventured near him he got out a pad and pencil and asked them for numbers of things and recorded this. 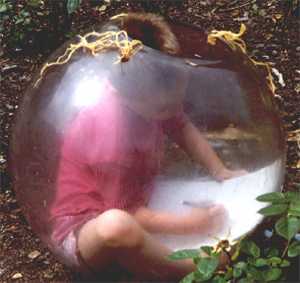 I thought this recording of tangibles fitted nicely with his estrangement inside the womb-like, fish bowl, container. When people asked him why he was in there. He asked them why they were out there. For my part of this performance I wanted to make something that related to each of the other artists in our group. In the days leading up to this we had each shown each other our work and talked about it as well as sharing ideas on the function of performance work. Pick up the 'seeds'. Read them and then finish my visions of the world by adding your own words. 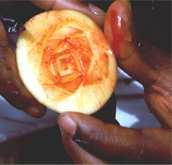 I wanted people to be directed in their responses and in a 'rosy' way, which is how I view the world at large. around the garden to interact with the various aspects of the "living creature".